Dress for success with BBI Grasshopper, the original mid-season, top-dress dry broadcast applicator from Salford. Are you interested in getting more information or a quote for the Grasshopper? Please fill out the form below and one of our Territory Managers will be in touch shortly. Dress for success with Grasshopper, the original mid-season, top-dress applicator from Salford. Holds 5 tons of fertilizer, 7 tons of lime - get your emergent plants the food they need to maximize yield with Grasshopper. Grasshopper features a high-clearance design to limit disturbing emergent plants, coupled with flotation tires for minimizing soil compaction. This spreader achieves precision application in both row crop and sod/turf farm environments - any terrain requiring a delicate touch. 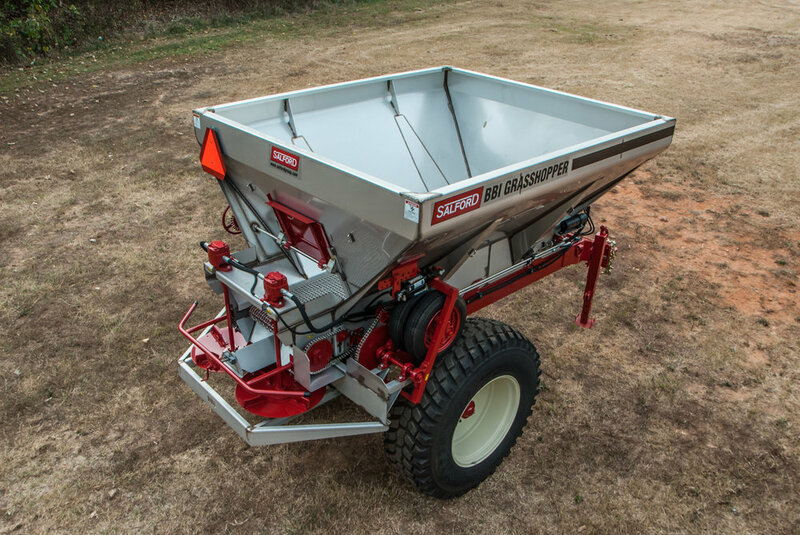 Don’t mistake this 9-foot, single-axle applicator with the light touch for being “light duty.” Grasshopper is built for durability without compromising precision, featuring ground-wheel-drive mechanics, and the original Salford spreader system for a consistently wider, flatter spread pattern. Powered by PTO or tractor-supplied hydraulics. Salford's BBI line of spreaders are capable of accurately broadcasting seed and fertilizer. Although best suited for wheat or grass seed, which are applied at higher rates, Salford's BBI Javelin and BBI Grasshopper and suited for top dress application. These top dress applicators can serve a multi-purpose role as mid-season cover crop applicator for higher rates of cover crop seed. Many plants need that extra helping of nitrogen booster this time of year, as the growing period between April and June often brings an excess of rain in many parts of the country. Top dressing your crops, with the help of a single-axle MagnaSpread or Grasshopper from BBI Spreaders, may make the difference between a mediocre yield and maxing out your potential. BBI Spreaders, a company committed to the design, manufacturing, and sales of spreaders for the agriculture, poultry, and construction industries, announces the launch of its dealer training video library.